Plan #07-219 (Queen Bookcase Headboard Plan) Combo Price Available! The bed...This is the queen version of our mate�s twin bed plan #03-202. The mate�s queen bed features six drawers (three per side) but you can choose to build only three drawers on one side if you lack bedroom space. To complement this bed, you may want to build the matching bookcase headboard plan #07-219. 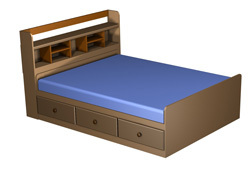 This bed is fairly easy to build, using hardwood veneer and solid wood drawer faces. Most of the fastening for the bed assembly uses corner zinc braces and screws, thus allowing for easy disassembly. The spacious drawers are built using simple dado and rabbet joinery. This plan also uses drawer slides but you may choose differently. This bed will accommodate a queen mattress in the range of 60" by 80". Twin (long) 38" by 79 1/2"
Double 53" by 74 1/2"
Double (long) 53" by 79 1/2"
Queen 60" by 79 1/2"
Purchase both plans for a special Combo Price and save$$! See details below. Photos, exploded views, detailed CAD drawings, optimized cutting diagrams, and a complete materials list.